I know but, see, I wasn’t ready for that. I wasn’t ready because I was led to believe that it’d be like whey protein powder or casein. You know, creamy? And sweet? Well, no dice – none. The stuff was savory. So I angrily stuffed the tub in the the back of my cupboard and forgot about it for months and months. Fast forward to now and you’ll find me in love with pea protein powder. I know, what a clown, right? Because there I was, practically kicking my tub of pea protein powder into the bowels of the bin and here I am now, buying it by the sackful. 1. Pea protein powder bakes beautifully (here’s evidence!) Unlike whey or casein, it never rises and takes over your baked food, drying everything up and making it come out rubbery. Sure, it has other issues (like the fact that it can make food far too dense and, if not sweetened correctly, can make your desserts have a weird savory undertone) but it retains moisture beautifully and is perfect for dairy-free baking. 2. 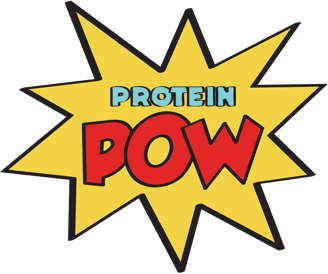 Pea protein is often sold with no other ingredients added in and it’s easy to find it organic and/or non-GMO form. I really dig this because I’m of the belief that the less ingredients a powder has and the better quality it is, the better it is to consume. What’s the point of a random bunch of XYZs, right? 3. Pea protein powder is PERFECT to make savory foods with! Things like protein wraps, protein tortillas, protein pizza, Protein Mac N Cheese, Protein Lasagna, and pretty much all kinds of low-carb pasta dishes – like the one in this post. I’m calling it ‘High-Protein & Virtually Zero-Carb Chicken Pasta’ but I want you to pay attention to not only the recipe but also the list of variations I have included at the bottom of this post. This list is there for you to go crazy with your pasta sauce and end up with something that will make you go, ‘MAMA MIA!’ So please do check it out. The final thing I want to add before I jump into the recipe is that if you’re in the UK, I have a special discount code for you so you can get a bunch of chicken breasts from Muscle Food. I partnered with them two months ago and I’m really excited about it because I have been buying my chicken for them for months and now I have a chance to extend a exclusive discount to you guys so you can buy it too – and buy it cheaper than I ever did! The code is POWCHICKEN and it entitles you to 5 kilos’ worth of Chicken Breast Fillets for just £19. All you need to do to use it is head over to Muscle Food, add one of these to your basket, and enter the code at checkout. Now, if you’re NOT in the UK and are feeling a bit booohohohooo about the fact that I’m extending a code to my UK readers and not you, please note that I have other discount codes for those of you in the US and Australia. You can find them underneath the NEWS section in the Protein Pow App. If you’re not in the UK, the US, of Oz, email me to request a discount code for a store where you live and I’ll do my best to chase one for you. 1. First, pull your chicken breast apart. The way you do this is as follows: Boil the chicken, let it cool, and proceed to pull it apart with your fork or hands. Easiest thing on earth. 2. In a nonstick saucepan further nonsticked with some low-cal spray or coconut oil, fry your onion until nicely browned. If you’re using granules, skip this step. 3. Add the rest of the ingredients to the pan and cook at medium heat, stirring constantly, so that your sauce comes together. If you find that the sauce is becoming TOO thick, add a more milk. If it’s too watery, add a bit more of the pea protein. Taste it to ensure it hits all the right notes. You might want to add more cheese, more salt, more pepper, some nutmeg, or, well… whatever you fancy. 4. Drain a couple of packs of Low-Carb Penne (or whichever low-carb pasta you’re using to make your pasta dish). Rinse and dry them well. 5. Once the sauce is nice and thick, throw in your pulled chicken and the pasta. Mix everything together. 6. At this stage, you can serve the whole thing OR, if you want to up your aesthetic points, add a bit more cheese on top and stick it under the broiler for ten minutes. 7. Garnish with more of the herbs and… PRESTO! Ready to munch. Macros per serving (out of four huge and really filling ones): 206kcals, 18g protein, 3g carbs (out of which 2g is fiber so net carbs: 1g!) and 9g fat. 1. When you reach step 2 in the directions above, add some chopped bacon (or chopped ham) to the onions. This gives a Carbonara element to the sauce that you can further exploit by adding a whole egg or two to it after step 5 above. 2. If you are vegan and want to end up with a vegan pasta dish, ditch the cheese (and the chicken, of course) and add nutritional yeast + some extra virgin olive oil instead. 3. Consider adding some steamed broccoli – or cauliflower – to the sauce when you reach step 5 to end up with a veggie-rich sauce. 4. Play around with your cheeses! Use parmesan, for example, or gruyere or, if you want to make your sauce creamier still, add some mascarpone or ricotta to the sauce once you reach step 5. 5. Turn the whole recipe into a chicken salad by adding some mayo (ideally homemade – here’s my recipe), raw chopped (red) onion or spring onions, and eating it cold.